Susie here today with a project featuring Moxxie's Soccer Collection. 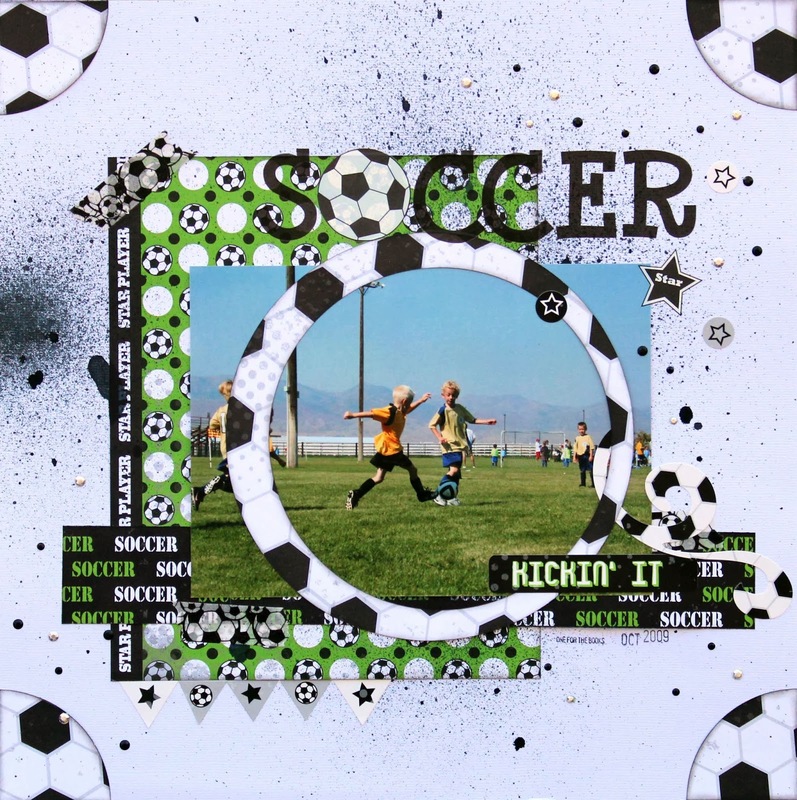 I used a t-shirt shaped chipboard album as the base and painted the cover before adding one of the Moxxie Soccer Cardstock stickers. I think it looks like a real shirt, don't you?! I used the star patterned border strip from the Goal paper on this page. It reminds me of washi tape...which I love! I used a hexagon shaped die to cut the photo on this page, then dressed it up with cardstock stickers and a swirl of black rhinestones. I stenciled the arrows on the page before layering on the cardstock stickers and photos. The hexagon die came out again for this page...I love how it echoes the pattern on the soccer ball! I will never forget my daughter's first steps. She was at her brother's soccer practice and she walked over and picked up the soccer ball. I hi-lighted these photos of her with cardstock stickers and a die cut arrow. I loved using the banner stickers under this photo. I finished off the back of the album with another cardstock sticker to look like another t-shirt. 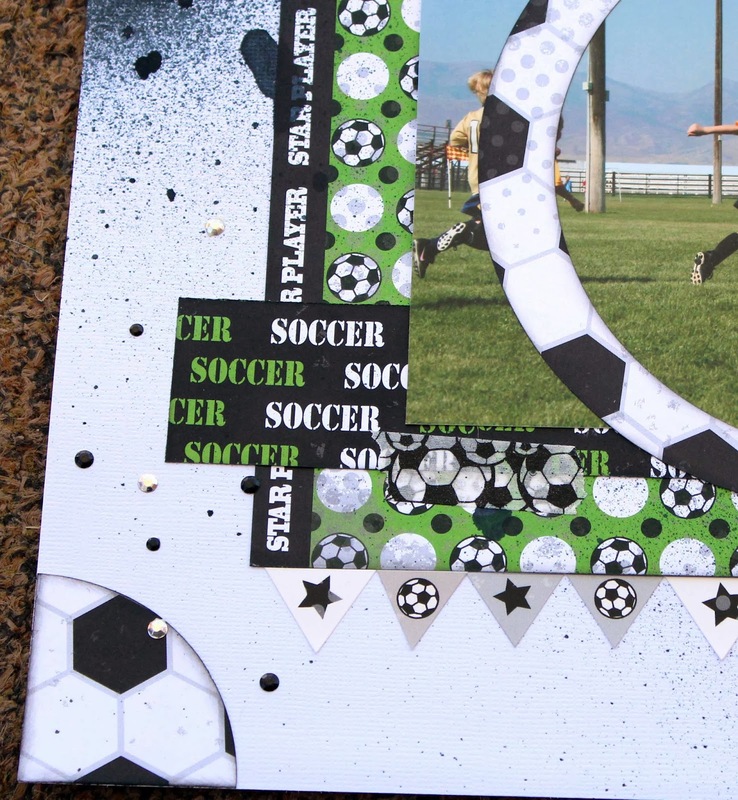 The variety of prints in this collection is just fabulous - just perfect for any soccer themed project! Moxxie Soccer Inspiration Week Day 5! Welcome to the final day of Moxxie's Soccer Inspiration Week! 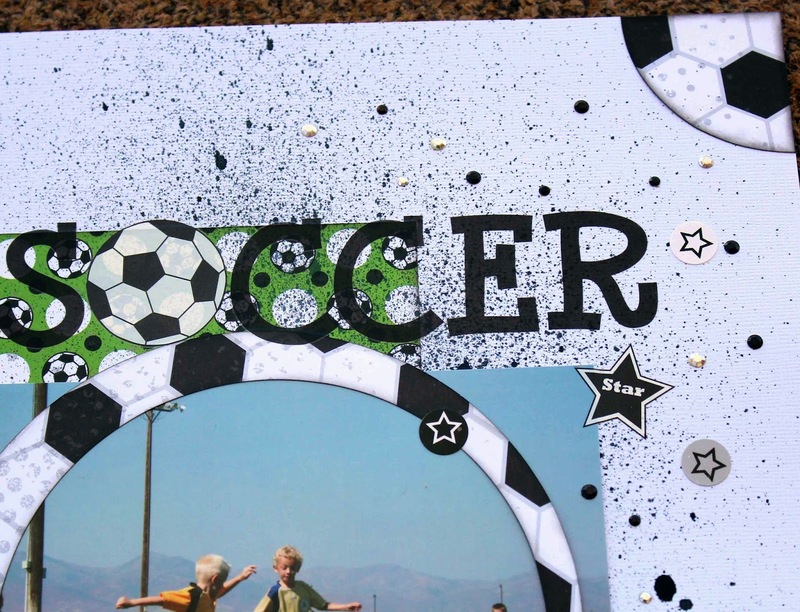 Susie here with one option for scrapbooking those "official" team portraits of your little soccer star! I actually used (2) sheets of Goal paper - one to cut out the letters and one to mat the entire layout. I trimmed the Kick It paper to an 11.5" square and centered it on top of one sheet of the Goal paper. I really like the detail around the edge! You can see that I matted each of the letters with black cardstock. The letters are 1.75" squares and the mats are 2" squares. And here's a really fun detail: I added little soccer ball rub-ons to a couple of the letters to jazz them up! Check out the "O" above and the "R" below! The cardstock sticker sheet has some great images and phrases. I popped them up on some chipboard - because I just love dimension - and sprinkled them around the layout to accent the photo and title. Hi! Moxxie Muse Dana here sharing two layouts today. Both of my daughters played soccer last year so I created identical pages for their individual and team soccer photos. I used each of the patterned papers as well as the cardstock stickers from this collection to design my pages. I added some ribbon for a fun pop of color. These pages are a great complement to the 2-pager that I created a couple months ago. I used 2 pieces of the same patterned paper for the base of my pages. I rotated the patterned paper on the right side of my layout 180 degrees so that the soccer balls would line up in the middle of the page. I then cut away the "Soccer" lettering from the page on the right, which was now upside down, and filled the space with patterned paper, dark green cardstock and the b-side of the bar code strip, which sports a fun star pattern, that I cut from the top of the patterned paper. The "Star Player" sentiments were also cut from the b-side of a bar code strip! 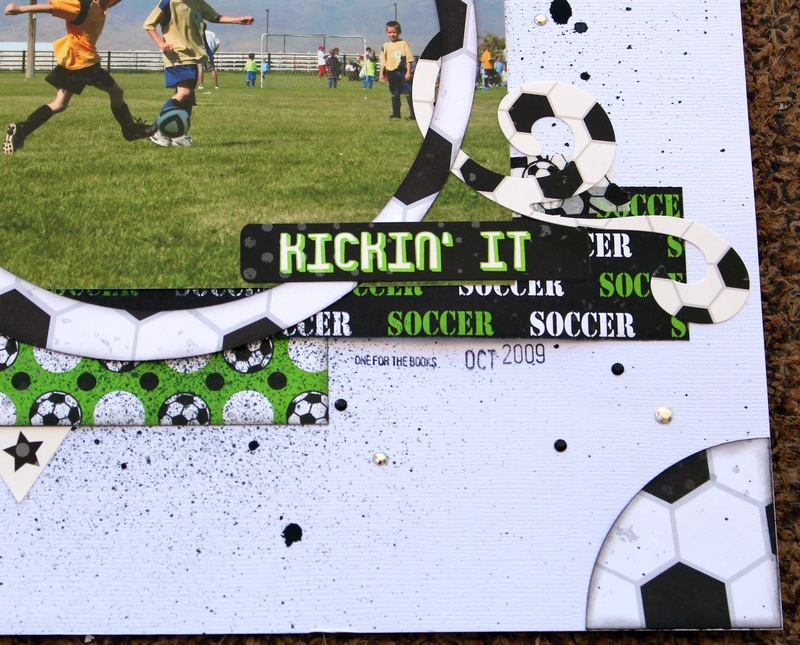 The "Kickin' It" sticker that I used for my title is from the Soccer Cardstock Sticker Set. 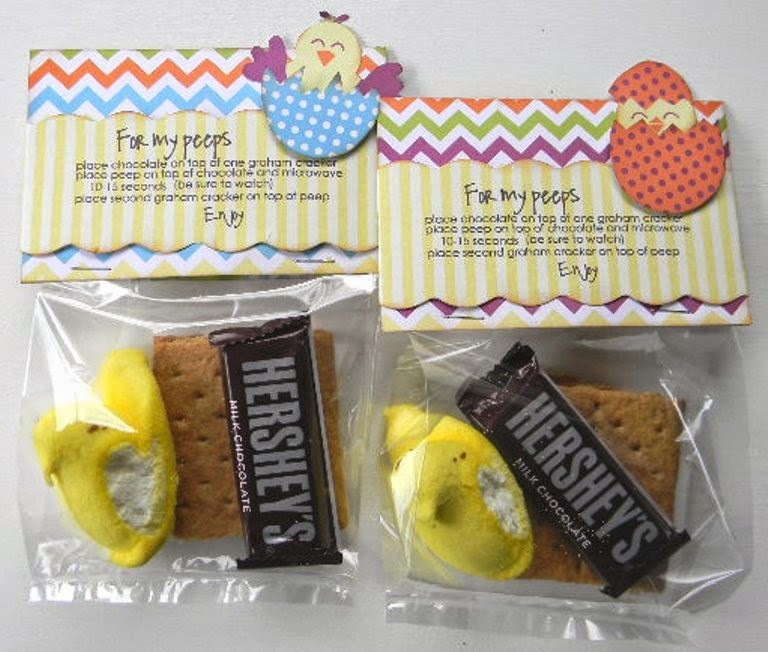 I used the medals that my daughters received for playing soccer as fun embellishments. Thanks for stopping by today! If this is your first visit to the blog this week, be sure to scroll down to see what the rest of the Moxxie Muses created to inspire you! We hope you find some time to play today! This line is just so fun! I started with my white background, decided I wanted a circle around my son in the photo and cut it from Kick It. I took the inside circle that was left and cut it into my four corner pieces. Of course I had to have some layers in there so I put some of Soccer down leaving the barcode strip reading "Star Player" on it. LOVE those barcode strips!!! Then I took a piece of Soccer flipped it over and ran it the other way across my layout. Of course the stickers and rub-ons are my favorite part. I added the Soccer & Star rub-ons for my title and then spruced up my layout with the cool cardstock stickers. Come back tomorrow and see what Dana and Susie have for you!